On the Origin of "Hack" and "Yack"
The following pieces by Joshua Sternfeld, Katharina Hering, Kate Theimer, and Michael Kramer are based on our session at the American Historical Association (AHA) meeting in 2014, “Digital Historiography and the Archives,” and the series of blog posts based on our presentations that we posted on Michael Kramer’s blog, Issues in Digital History, and cross-posted on AHA Today. We are thrilled that JDH invited us to submit our blog posts for publication. We had conceptualized the session as an interdisciplinary roundtable discussion with short presentations by each panelist, followed by a rich and multifaceted discussion with the audience. Expanding upon this format and our engaged in-person discussion, we had hoped that the series of linked blog posts would serve as a virtual, extended roundtable. Because it exists in the liminal, intermediary space between traditional conference session and formal publication, we imagined it as an experiment in new forms of “open source” scholarly communication. In sharing our work in provisional form, we hoped to encourage readers to continue this discussion on the blog. While we are publishing the discussion papers in JDH in a more traditional format, the original idea behind the roundtable remains unchanged, and the blog continues to offer a space for posting criticisms, comments, ideas, and reflections. The preservation, analysis, and representation of digital information in digital collections, archives, and other media poses complex, challenging, and often confusing issues for historical researchers, archivists, digital humanists, and librarians alike. Whether we even call these digital materials “archive” is at stake. We hoped to address some of these issues in the session and subsequent blog posts, while also discussing some of the elements of a framework or vocabulary that can support a critical appraisal of digital information. 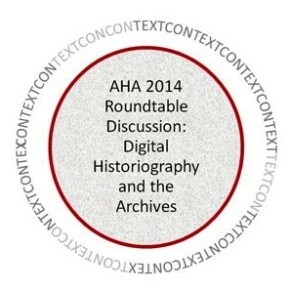 In his 2011 article in The American Archivist, panelist Joshua Sternfeld introduced such a framework called digital historiography, which he defined as the “critical, interdisciplinary study of the interaction of digital technology with historical practice.” The AHA panel was originally organized, in part, as a response to that work. All participants in the panel emphasized how archival theory and practice need to be an integral element of such a critical framework, along with evolving historiographical and professional practices. The digital medium has challenged historians to expand their knowledge about archives, and understand their function in generating scholarship and knowledge. But what might be the key theoretical and methodological questions surrounding the intersection of digital archives or digital collections and historical practice? What materials do archives collect and preserve, and why? Which materials are selected, and which are excluded? What are the driving forces and principles guiding the contextual information about collections provided by archives? Which political, social, economic, and cultural power relationships now structure the archives? How do we cope with the sudden, and at times unexplained, disappearance of collections in digital archives (portions of American Memory being a prominent example, as one audience member suggested)? How important is contextualization of collections in the digital environment? How can archival metadata be better situated in place and in time? These are questions that archivists and historians might come together to confront in critical and productive ways. Fortunately, not only has the digital medium unleashed a heightened awareness of established archival principles and historical practice, it has also introduced new lines of theoretical inquiry. Historians and archivists are beginning to work with sources of varying scope, format, and provenance, thereby challenging both fields to reconsider the limits of historical inquiry, the contextualizing properties of metadata, the design of access systems, and the engagement of new audiences. In short, trends in digital scholarship and practices have contested our collective conception of “the archive” as well as the role of the twenty-first-century historian. What became evident from the session was that historians must collaborate with information professionals, including archivists, to create critical contextual information for sources, reference resources, and repositories as well as new kinds of scholarly work that harnesses the power and registers the challenges of the digital archive, while serving a diverse community of users composed of researchers, educators, information professionals, students, artists, policymakers, and members of the public as a whole. The question is how? What areas of research should be explored and what methodologies, theories and practical models are already under development? We hope that sharing materials from the roundtable on the blog and now in JDH, even in provisional form, will continue to provide a catalyst for sustained discussion. Originally published by Katharina Hering, Michael J. Kramer, Joshua Sternfeld, and Kate Theimer on January 21, 2014. Revised for Journal of Digital Humanities in August 2014.